Avni Kantan/Demotix. All right reserved. In his 14 June editorial in the Guardian, Kenan Malik rightly warns against oversimplifying Middle Eastern politics along the binary opposition of religion and secularism. Yet in the case of Turkey, Malik himself oversimplifies. His article leaves one with the mistaken impression that Kemalist ideology ruled Turkey uninterrupted until overthrown by the Justice and Development Party (AKP) in 2002. His view seems to be that Turkish secularism lacks a popular basis, yet managed to hold onto power until relatively recently due to military and elite connections. Malik’s arguments underestimate both the extent to which the secularist project has taken root in Turkish society, and the presence of Islamism on the political landscape long before its recent incarnation. Already in the 1960’s the center-right Justice Party (AP) employed Islamic rhetoric fused with anti-communism to combat the Republican People’s Party (CHP), which in those days enjoyed widespread support among the urban proletariat. Pace Malik, the secular social democrats had a popular base broad enough to make Bülent Ecevit prime minister in the 1970’s—though even he was willing to form a coalition with Necmettin Erbakan’s avowedly Islamist Party of National Salvation (MSP), the forerunners of today’s AKP. Conservative Islamist politics did not start with the AKP, nor has its ascendency been a mere backlash against authoritarian secularism. Rather, the rising star of Sunni conservatism was intimately bound up with the Cold War, helped along by the very military so often enlisted as the bogeyman of the secularist diktat. The coups that have done the most to shape the subsequent political landscape were those of 1971 and 1980, neither of which had much to do with restraining Islamist urges. The military regime that reigned in the early eighties did its part to weaken official secularism, instituting mandatory Sunni religion classes in public schools in a concerted effort to depoliticise a fractious youth and tame the left. Turgut Özal, who came to power in the wake of the coup after having served as the generals’ economic advisor, greatly expanded the number of religious public schools (İmam-Hatip okulları) tasked formally with training members of the clergy, but increasingly seen as a publically funded alternative to the secular education envisioned by Atatürk. Still more crucial to an understanding of Turkey’s current cultural conflicts is Özal’s other legacy: the long transition to neoliberalism that began on the eve of the coup and has come to completion under the AKP. From a heavily unionised country with import-substitution policies and a strong agricultural sector, Turkey became a free-trading exporter of low-value-added industrial products made by workers in increasingly precarious conditions. Turkey’s neoliberal turn created an informal proletariat ill served by the traditional labour movement—hampered as it was by restrictive legislation and coup-era repression—and inclined to look instead to ethnic and religious bonds as sources of solidarity. As labour sociologist Erdem Yörük has shown, the AKP and its Islamist predecessor parties have excelled at addressing this demographic, offering not only religious community but also an expanding network of informal welfare programs that kept the poorest from complete ruination. Nowhere is the deep contradiction of Turkey’s political economy more apparent than in the mine explosion that killed over three hundred workers in Soma last spring. Having been turned over by the AKP to a company that boasted of cutting operating costs by over 80 percent (implicitly, by skimping on safety measures), the recently privatised mine provided coal to the government at below market price: which coal the party then distributed to poor urban families at election time. In response to this and other such accidents, Erdoğan’s rhetoric naturalised the event through heavy use of the terms kader (“fate”) and fıtrat (“nature, appointed role”), both explicitly Islamic concepts invoking submission to the way things are. Soma laid bare the contradictory triangle of AKP political practice: exploitation—welfare—religion. 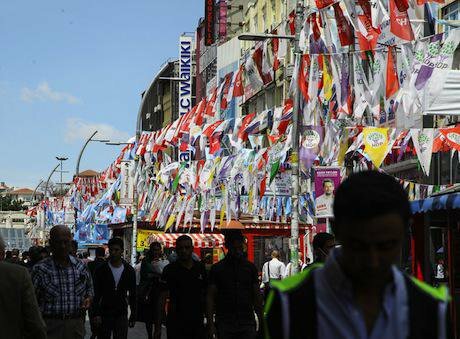 The second of these terms is not to be underestimated, for material concerns motivate AKP voters at least as much as do religious identity politics. On both fronts the left has to convince the working class that it has something better to offer. Here the HDP’s electoral advances are a step in the right direction. The HDP did not achieve this step by embracing identity politics, but by working to transcend it. While Kurdish politics have long featured strident demands for such ‘cultural’ rights as the free use of the Kurdish language in politics and education, in this election the party chairman was careful to articulate such demands in the language of local autonomy, in principle applicable everywhere. Municipalities, he said, should have control over their own schools and police forces. He has argued that such decentralisation is not “separatism” but rather a project to make Turkey more democratic. The HDP campaign made alliances with women’s and LGBT groups, at the risk of offending conservative Kurds. On questions of secularism, the party staked out a position respectful to religion but hostile to its instrumentalisation by the state. On these grounds Demirtaş called for the abolition of the state Directory of Religious Affairs, and continued to do so in the face of poll numbers indicating that his stance was losing him votes. A 2012 education reform law that effectively facilitated the removal of many high school-aged girls from school met with steadfast opposition not only from the traditionally Kemalist CHP, but from the HDP as well. There is nothing self-evidently Kurdish in these choices. The HDP’s origins in the Kurdish national movement do not preclude its potential to help revive universalist left-wing politics in Turkey, especially if it gets the chance to work together with a CHP moving in similarly progressive directions. That party’s support for Kobanê last fall, its populist calls for a higher minimum wage and the greater inclusivity of its candidate list this year, which included more women and members of ethnic minorities, are causes for hope. Such measures are not concessions to identity politics so much as departures from the Turkish nationalism historically central to the identity of the party founded by Mustafa Kemal. While it will be no small feat for Atatürk’s admirers and those of Abdullah Öcalan to work together, a mutual enemy as strong as the AKP has taught the more thoughtful in both camps what they have in common. Kenan Malik is right to worry about the potential of identity politics to undermine the emancipatory and universalist agenda traditionally expected of the left. In the case of Turkey, however, he is worried about the wrong people. As the HDP transforms itself from the Kurdish party to a partner in the reconstruction of the Turkish left, identity politics may soon become a preserve of the right: which is where, for the most part, it belongs.